Have you ever had a chocolate covered orange? Back when my family hung up stockings (thank you so much to my parents for not depriving my brother and me of the joy of waking up to a stocking even though we’re J E W I S H), I’d always find a big, round, shiny foil-wrapped orange in the toe. I would whack it on the counter until each segment was separated, and then ration it by eating one piece per day – it would last me until mid-January. I think that’s when I acquired my taste for dark chocolate. My grandma would always keep (and still keeps, in her nursing home room) a bowl of individually wrapped Dove chocolates around. Skip to the glass bowl to snag a chocolate, then to my chocolate orange stash, then to the kitchen for a warm caramel roll or some freshly baked bread… THOSE WERE THE DAYS!!! Anyway. This cake was a happy accident. My friend requested a red velvet cake for his birthday, but I was out of food coloring, so I decided to try something new. 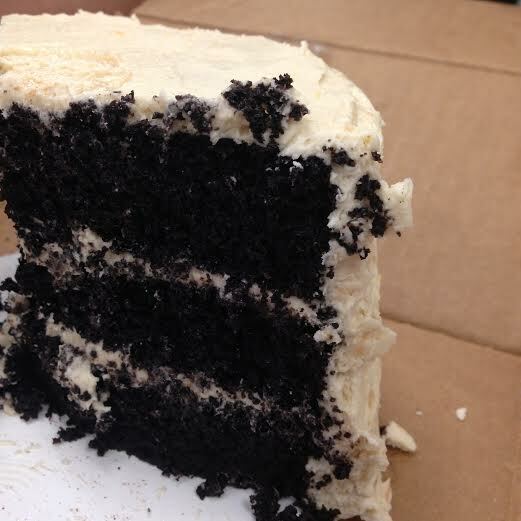 I didn’t get a good picture of the three-layer cake that I made him (no good lighting, blah, blah), but I managed to take a quick shot of the inside just to showcase the texture. Then I got home and assembled the one layer I had left. Details for the cake are below!! 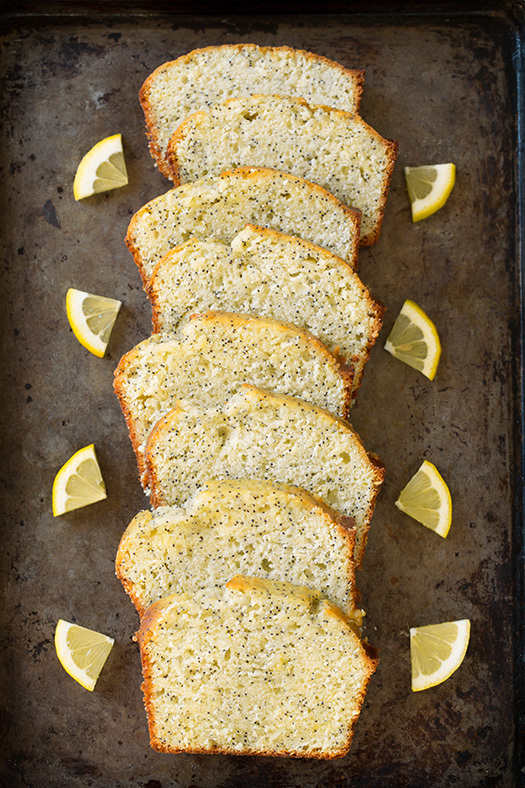 I also made Cooking Classy’s lemon poppyseed bread this week! Creds to her for the picture! It’s to die for. 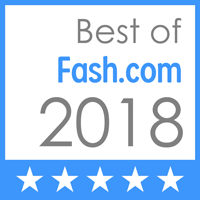 I recommend it 100%. I made lemon poppyseed scones the same night out of my Alice’s Tea Cup cookbook. Very light, very lemon. 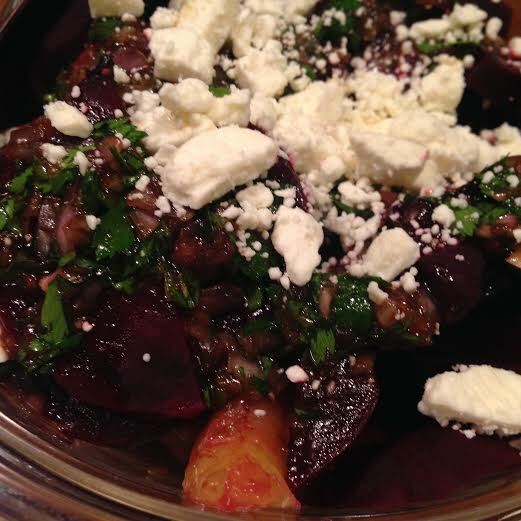 I’m finishing off this citrus-packed week with a roasted beet salad with feta and some fresh orange wedges. FOR THE CAKE. 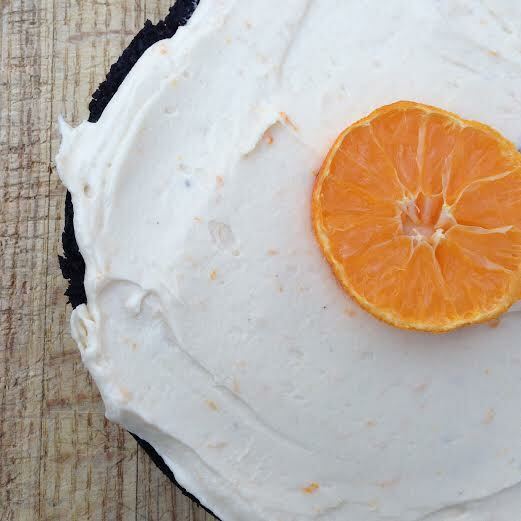 I made my favorite dark chocolate cake and frosted it with a clementine and grapefruit (so almost orange) buttercream of my own devise. Before adding the frosting, I brushed each layer with a mixture of clementine juice and heavy cream. I got this tip from the Momofuku Milk Bar, and it’s just divine. It keeps the layers moist and adds a really subtle citrus flavor to the cake, marrying it happily to the bright, tangy frosting. Preheat the oven to 300º fahrenheit (300!!! Not 350!!) Grease two six-inch pans and line with parchment paper rounds (if you want to make an eight-inch, just double the recipe). Mix the chocolate with the hot coffee and set aside (don’t stir). Whisk together the sugar, flour, cocoa powder, baking soda and powder, and salt. In a stand mixer, beat eggs until thick and lemon colored. Add the oils, buttermilk, and vanilla. Stir the chocolate-coffee mixture and add it to the wet ingredients. Add the dry ingredients to the wet and beat for twenty seconds. Pour evenly into the pans, filling them a little more than 3/4 of the way (you’ll have a little batter leftover). Bake for about an hour – just keep an eye out and check them with toothpicks until they come out clean with a few moist crumbs attached. Let cool for five minutes in the pans, then turn out onto racks and let cool for at least an hour. For the frosting, beat the butter until fluffy, about two minutes. Add the remaining ingredients, adding the juices until you’ve reached your desired consistency. Beat on high for five minutes (this is important! It lightens the frosting and doubles it in size). For the soak, stir the two ingredients together. Slice each layer in half lengthwise (they will be thick). Brush with the soak. Fill and frost. I chose to use three of the four halves, but you could definitely use four. Or two. Top with a slice of clementine sprinkled with sea salt! 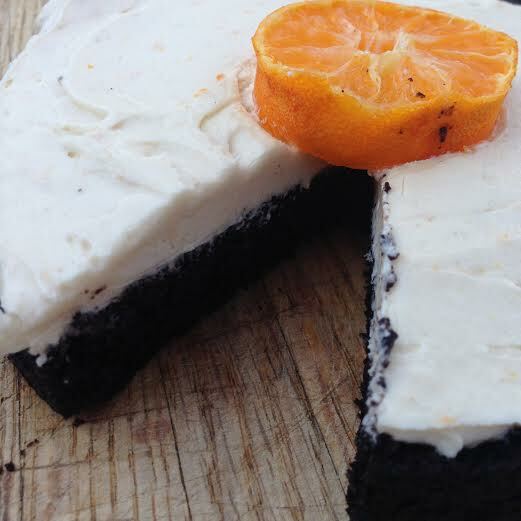 Bring this cake to a dinner party with a few close friends or make it for a night-in with your significant other. It’s meant to be savored, not ravaged by a crowd.